Caught up a few fish this weekend, for some measure ups and general inspections. Took some pics and videos to track their progress. First up - this two step, currently 32cm. Not the largest, but the red and white stand out compared to the others in the tank. You see the odd fleck of gin rin in the scales - some say that's a sign that the fish will develop good skin quality. 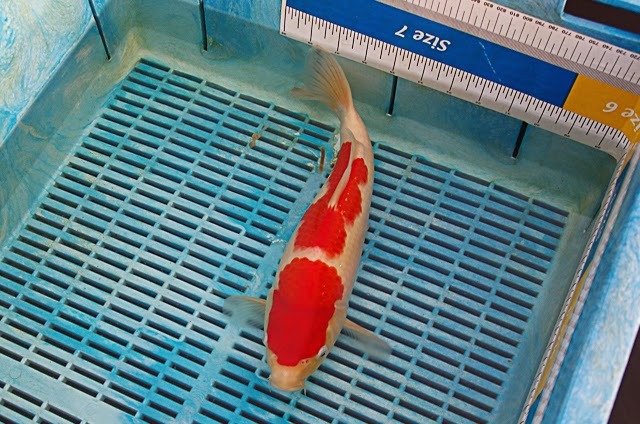 I first saw them on this fish at around the 15cm mark - and so far, the skin and red are developing well. This one was 30.5cm at Christmas, and measured in today at 34cm. Not bad going! I've struggled to hold temps in the tank over the last few weeks with the cooler air temperature - the tanks have been at 20 degrees last week, and 21/22 the previous couple of weeks. The air temps looks to be on the up, to a balmy 5 or 6 degrees during the day and above zero at night, and that will be enough for me to be able to hold the tank at 21/22. I've decided to hold off covering the pond - it's something I'll evaluate in the round at the end of the growing on season. I've adjusted the feeding regime down a bit to allow for the slightly cooler temperatures. Its on my mind to thin this tank out a little bit; I have the green vortex tank connected to the growing on system which could take a few - they'd be in the same filtration system, but the load would be lighter as they will be fed maintenance rations rather than growth rations. But it's going to be March before I can move a decent number to an ambient tank.